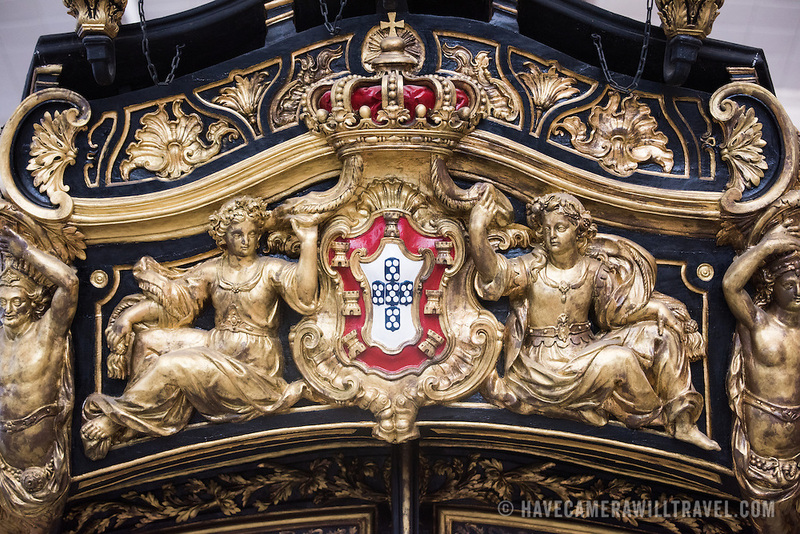 The decorated stern of the Royal Barge (Bergantim Real) was built in 1778 by order of Queen Maria I, in Lisbon, for the betrothal of Prince Joao, later King Joao VI. She was manned by 80 oarsmen, 1 coxswain, and 1 bowman. The last time she was in service was in transporting Queen Elizabeth II on the River Tagus during her visit in 1957. The Museu de Marinha (Maritime Museum of Navy Museum) focuses on Portuguese maritime history. It features exhibits on Portugal's Age of Discovery, the Portuguese Navy, commercial and recreational shipping, and, in a large annex, barges and seaplanes. Located in the Belem neighborhood of Lisbon, it occupies, in part, one wing of the Jerónimos Monastery. Its entrance is through a chapel that Henry the Navigator had built as the place where departing voyagers took mass before setting sail. The museum has occupied its present space since 1963.